Back-to-school? Yep, you read that right. Hang with me! This is great back-to-school fun! You see, the back-to-school issues of The Mailbox magazine are on their way to mailboxes, in-boxes, and dealer stores right now. 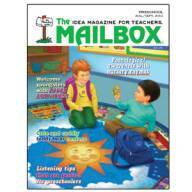 And every reader of The Mailbox magazine, no matter what grade level, is in for a fun surprise! Guess what? The Mailbox magazine has been given a makeover! A face-lift was first—you’re going to love the new cover. A few cosmetic touch-ups were also completed. These include new page designs and web icons. (There’s more; however I’ll leave it up to you to discover them!) New departments, such as “Good to Know” and “Problem Solved!”, were added. (Hmmmm, I’ll pass on linking this to my makeover theme. 🙂 ) And because no nips or tucks were needed, you’ll still find all the wonderful activities, tips, patterns, worksheets, and pull-out activities and posters you’ve been getting! You know what happens when I get totally jazzed about good news, right? I gotta have a giveaway! Tell me what new things you discover in your August/September magazine issue (and what you think of them) before the first official day of summer—June 21—and your name will be entered in a drawing for a “sum-sum-summertime” surprise from The Mailbox! Have fun! Congratulations to Gina! Her name was selected in the drawing for the surprise. PS If you aren’t a subscriber, click here for a free trial issue of The Mailbox magazine! Can’t wait to get my issue. I just subscribed again. Preschool Mailbox- “Problem Solved” Love the ideas on one page. Love the new “Our Readers Write” pages! The ideas are written big with big pictures. I think I will cut and put on index cards! In the Grades 2-3 issue I really like the Problem Solved and Good to Know sections. I especially noticed the enhanced cover text. It really grabs my attention. Nice job Mailbox! Thank you, Mailbox. I have subscribed to this magazine for more than a decade and I love how it has continued to evolve with the changes in education. I’ve found great success with your center games–I send them home monthly with the children to share with their parents for home enrichment. The new format looks very user-friendly. I look forward to using it! I like the new format for the most part…but some of the pages look like ads instead of ideas, and it was hard to distinguish between the two. My biggest complaint was receiving the issue too early!! I have just finished the last day of school and really DO want my mind to take a break before thinking of the first day of school. Could you please mail the August/September issue in July? Wow! 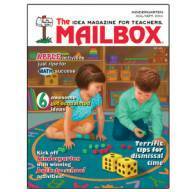 I love the new look and updated version of the preschool Mailbox magazine. It seems to be more activities to use with books – which I love to do everyday! I start school the first week in August, so I have some wonderful new ideas to get the year started. I especially love the circle time pages! Thank you. I love the new Mailbox! I especially love the little reminders that you can find things online if you want to print them. What a great idea and such a HUGE help! I didn’t like receiving my back to school issue before I even finished the school year, but I did look it over when it came. I noticed the difference right away. It was bright and seemed more organized. It seemed to contain more center activities than before. I love the Our Readers Write Pages, i love the ideas they always have. I got the magazine, I noticed the changes and they really look good. I do not think the Aug/Sept. mag needed to come in June. Later in the summer would have added anticipation to the new school year. I loved the new back-to school issue! It got me excited for the fall even though I’m ready and happy to have summer break. I liked all the new content and aesthetic changes that were made. You guys just keep on getting better and better!! I love the new look! So glad you have center activies and ideas! This issue is ROCKIN’ the kindergarten world. Thanks for the new look and the new additions. I really like the changes to Mailbox. It seems cleaner and less cluttered. I always love getting the magazine and beginning to think about the next school year….however, I got this one before I even got out of school. But I still had to read it! It always motivates me for the upcoming year! Sorry to say I do not like the new feel,format, or font. I also don’t care for the Facebook comments printed on the pages. The “new” Mailbox actually looks like my ’90’s Mailbox issues. I can’t make up my mind. I have been using the Mailbox Magazine since the early 1980s and have seen it go through a few changes, so it always takes time to get used to something new. I like that you still can access the web for pattern, cards, and other things. I also like that you kept the pull out poster in the middle. I like the facebook quotes in the magazine, Good to Know, What Can You Do With A Minute or Two, and Problem Solved. I do not like when you have the stiff mail in cards and the gooey page stuck to the outside of the magazine. Overall…I love this magazine. I have used it most of my 28 years of teaching and will continue to use it until I retire! Thank you for all of the wonderful “tools” you have given me over the years! I love the magazine, but don’t like the cover as much as the old one. The old cover gave me an easy list of exactly what was in the issue so that I could easily find ideas for different themes. The new cover doesn’t show a list, so I have to go searching to find out what the issue has to offer. I like the new look. I like the problem solved sections. I also like the reminders that you can find extras online. It will take a minute to get use to the changes but changes are good! I am so glad you left the oldies but goodies in there!! I love the ready made center and the centerfold games and posters (I get both the preschool and kinder editions)! I have used the mailbox for many years and over multiple grade level changes. The changes are welcome, but do not always fit my needs. Most recently – why send the magazine so early when I still cannot access the online component? I work for two different agencies and I find this works well. What to Avoid: Complaining or creating a pity party. Teachers call this classroom management technique, the low profile intervention.